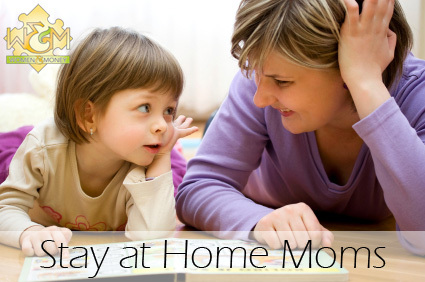 Stay at Home Moms - Women and Money Inc. I just heard on the radio today someone wonder about what it is stay at home moms do all day. I was surprised because the less than dignified remark came from another mom. However, this mom works, shuttles her kids around after work and still finds time to send friends emails. Wow! We don’t even know what the working mom’s point is. Is she saying she can do anything or everything better than stay-at-home moms? Is she saying stay-at-home moms are lazy and have it easier than her? What we do know for sure is this. The working mom is angry. The question is really, who is she angry at? Stay-at-home moms or maybe herself. I recall an incident that happened early in my career that involved an angry provincial government social worker. She seemed to be angry at her clients and anyone she talked to. After a few quiet moments with her, I learned that she had a young child at home who she was actually worried about. She really wasn’t angry, but frightened. The radio program didn’t dig into the merits of the accusation against a common perception that stay-at-home moms have it easy or easier than working moms. This opens the door to the very serious issue of raising children in our society. Should a parent be at home with young children? How many parents are working not because they prefer a career over their children, but because they have no choice – they need the money to pay the rent and very real costs of raising children today. How much quality time do children need from their parents? There are so many questions to be asked and answered. What we have learned in the last 40 years about raising children in North America is this. From birth to age 6 children enjoy the most active cognitive developmental stage in their lives. This means their little super-energized brains are hungry for information, experience, stimulation, experimentation, play, fun, sports and on and on. This is one of the most important times to give children quality time – to teach them life skills, language(s) and to enjoy each other – to enjoy the purity of their innocence and to cherish their growth and unconditional bond of love. We have learned that older children still need their parents around – especially after school with the perils of drugs, gangs and crime lurking on school grounds and in even the best neighbourhoods. I think we should celebrate children and families much more than we do. We should recognize both working and stay-at-home moms and dads for their combined efforts to give their children a better life.